In his previous post, Craig Morris began his summary of the 1985 book entitled (in German) The Energiewende is possible. Today, he sheds light on how the trend towards large power plants created unnecessary costs in the process – although more efficient distributed cogeneration was an alternative. The authors of the 1985 Energiewende book say that regulators of power monopolies were not as savvy as the utilities they monitored. The regulators focused on prices but not on whether particular projects needed to be built. Power companies managed to convince the regulators that everything proposed was needed to prevent blackouts. The threats of blackouts were not properly questioned. But the regulation scheme described above essentially incentivizes overbuilding. If a utility wants to increase its profits, it needs to increase revenue – the profit margin is more or less a percentage set by the government and cannot change much. During the overbuilding, the focus on large power plants also partly resulted from the structure of cross subsidies. Large industry could theoretically set up their own small plants, so utilities had to underbid those options. Large plants have high upfront capital costs with relatively low operational costs. The high capital costs are the thing utilities can pass on at a regulated profit margin to defenseless households, whereas the low operational costs allow utilities to sell at cutthroat rates to large industry customers. Unlike industry, households could not produce their own power cheaply in the 1980s, so costs were passed on to them. Today, small power consumer still cross-subsidize large ones. All of these factors came together to make a focus on ever larger power plants seem obvious from every angle – except efficiency (see previous post). The large power plants had knock-on effects. The authors cite the city of Osnabrück (population: 150,000) as an example of how even midsize municipalities were able to make do with a 20 kV grid. But the large power plants required 110 kV and eventually 380 kV lines. Today, the expansion of these high-voltage lines is a tremendous bone of contention in Germany’s energy transition. The historic irony is that all of these high-voltage lines that the Energiewende allegedly now needs were actually built for the large central power plants that the energy transition needs to get rid of now. The industry customers hooked up to those lines covered only half of the cost for the 380 kV lines – and paid no other grid costs. The rest was passed on to the defenseless small consumers. Today, firms that consume enough electricity (the ones that thus need the grid the most) are exempt from the grid fee. A German court even ruled in 2013 that the practice was unconstitutional (report in German), but that does not seem to have changed anything, for this report from October 14 2014 (in German) says the number of exempt firms now exceeds 4,000 – so it is rising. We have also written extensively about industry exemptions from the renewable energy surcharge. As the Energiewende book from 1985 shows, this policy has a tradition. Utilities claim that the focus of energy policy is on reliability and affordability. “Affordability” was obviously, though not explicitly, defined in terms of large consumers, not households. In terms of reliability, the authors convincingly argue that large power plants actually endanger supply security. A major outage occurred on 17 February 1985 in France, for instance (while the book was being written), when 6,200 MW failed at once. We have also discussed in this blog the difference between fluctuating renewables and intermittent conventional power – when large conventional plants fail (and they do), filling that gap quickly poses a tremendous challenge. Towards increasing supply reliability, a larger number of smaller plants would make much more sense. In 2011, when Germany suddenly shut down eight nuclear plants within a week, the world realized how much excess capacity the country actually had – the immediate closure of around a tenth of installed conventional capacity caused no problems at all. On the contrary, the country reached record power exports in 2012, 2013, and 2014. And again, there is a tradition to this excess capacity. In my next and last post on this book, I investigate the remedies the authors proposed. 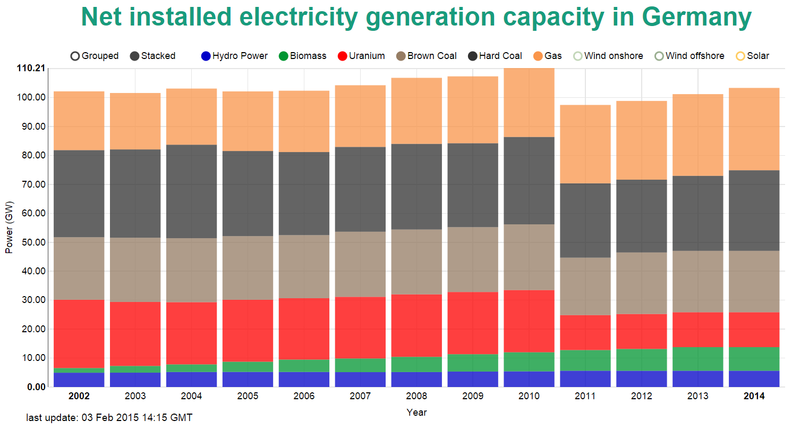 Looking back at the Energiewende 1980 – 55 Percent Coal?